Bang! Slam! There it is again! Maybe you have old cabinets, or maybe you just have kids, but either way a slamming cabinet is a noisy nuisance. There is a simple, effective, and budget-friendly solution that only takes a few minutes. For quick installation and quiet cabinets, all you need are Furniture Buffers rubber non-slip pads. Lightweight, rubber-foam protectors like those used to stop furniture from scratching your hardwood floors are the perfect hack to quiet your home and prevent damage to your cabinetry. Installation only takes a few minutes, and the only optional tool you might need is scissors and maybe a pencil. 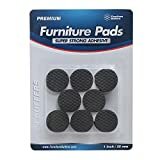 When shopping for the cure to your ear harassment, look for the small 1 inch pads that can function as chair protectors. 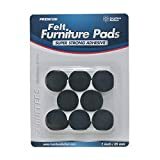 These Furniture Buffers non slip Pads are an excellent product, as they provide a super soft, absorbent pad for cabinet doors to bang against. Also, they’re incredibly sticky which means you won’t have to worry about them falling off constantly. Lower quality pads tend to fall of with moderate use, and since your cabinets probably see regular activity you’ll want to choose ones with great adhesive. These honeycomb design cushions use the strongest adhesive on the market, making them an easy choice. First, determine how many protectors you’ll need by estimating 1-2 small buffers per cabinet door. Open and close the door to see where it makes contact with the cabinet. After determining where the door and cabinet connect, mark the spots with a pencil. Peel off the paper backing and apply pads to the pencil marks – or just try putting them on the outside two corners where they hit flush against the edge of the wood opening. Test the noise level and you’ll find the clanging has diminished by 90%. Sit back, relax, and enjoy the peace and quiet. It’s that easy to banish the never-ending banging sound. No need for screws, nails, tools or a handyman, just invest in Furniture Buffers pads and protect your cabinets along with your floors. Depending on your floor usage and whether you mind if your furnishings slide, you may want to pick up a 24 pack — or if you have some serious chair and table legs to cover, go for The Jumbo Pack variety pack of floor protectors that comes with 8 different sizes with 2 sheets for custom creation. Start back at FurniturePads.net again to read more on how to protect your home property.